With a wonderful texture Scleranthus biflorus makes a great ground cover plant. From a distance it looks a lot like moss. Scleranthus biflorus will grow in full sun given adequate moisture. Usually sold in pot sizes to 15cm by wholesalers, larger quantities for mass planting should be ordered in advance to ensure supply. This is a creeping matt forming plant, grown for the foliage, small flowers in summer are not really a feature. 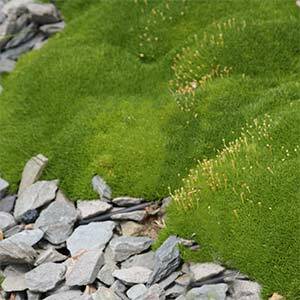 Very useful as a groundcover plant either in mass plantings or as a feature in landscaping projects. Evergreen although will become dormant in colder climates during winter. Requires extra water during hot dry periods. Fertilize with a slow release low phosphate fertilizer in early spring. Scleranthus biflorus and Scleranthus uniflorus, the first has tighter foliage than the second, and is slightly lower growing. Excellent plant for commercial planting in no traffic areas where a dense ground cover plant is required. Available for sale from the following wholesale growers.